So often Roussillon is lumped together with the Languedoc, as one big mass of vineyards, when in fact there are quite distinct differences between the two, both in their history and in their wines. For a start most of Roussillon, which represents the present-day department of the Pyrenées-Orientales, was Spanish until the Treaty of the Pyrenees in 1659. The area still enjoys a strong Catalan influence in its culture and wines, which you simply do not find further east in Montpellier and the Languedoc.For decades wine-making in Roussillon was centred upon vins doux naturels, the sweet wines based on Grenache, Noir, Gris and Blanc. Table wines, namely Côtes du Roussillon and Côtes du Roussillon Villages, developed later, but none the less reached appellation status earlier than their counterparts in the Languedoc. And a corner of Roussillon, the western end of the Agly valley, remained firmly French and spoke Occitan, rather than Catalan. The frontier was at the evocatively-named village of La Tour de France. Much of the wine production of Roussillon – and vines are really the only form of agriculture that these wild, arid hills will support – remained in the hands of the village cooperatives. 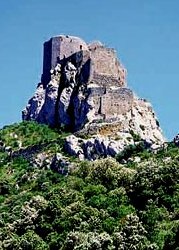 The first independent producers of Côtes du Roussillon really only began to appear in the mid-1980s, but they were often frustrated by the limiting restrictions of the appellation regulations and preferred to make wines unhampered by bureaucracy and so turned to vins de pays, which proliferate all over the Midi. Until very recently the département of the Pyrenées-Orientales boasted five, of which the Côtes des Fenouillèdes is beginning to create a certain reputation for itself. 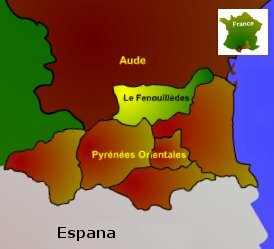 The name Fenouillèdes derives from fenouille or fennel, and refers to the abundance of fennel covering these hillsides, while the Coteaux des Fenouillèdes described the cluster of villages at the western edge of the Agly valley, most of which concentrated on vin doux naturel, either Maury or Rivesaltes. But these are no longer as popular as they once were. Saes have plummeted, and the village cooperatives are feeling the effect. The older viticulteurs have retired, and in some cases sold their vines, and the younger ones have realised the urgent need for a change of direction. Suddenly it seems, not quite overnight, but in the space of two or three years, there has been the most wonderful renaissance of viticulture in the Agly valley, with a large influx of newcomers who appreciate the viticultural originality of the region. Take the village of La Tour de France, in 2001 there were three estates alongside the village cooperative; today there are nine; and that is an example of just one village. Suddenly it seems that people have woken up to the fact that old Grenache vines can produce the most wonderful wine. The same thing has happened across the border in Priorato, but in the Agly valley, vineyard prices have not yet soared, and a hectare of old Grenache will cost you 10,000 Euros. Often, the exact age of the vines is unknown; after 50 years the cooperatives stop keeping records. And Grenache flourishes in this sunny corner of Roussillon, where rainfall is low and the drying Tramontane blows over the hillsides of schist. The scenery can seem wild and unforgiving, but on a sunny day, it was simply breathtaking, with the almond blossom providing splashes of white against the rugged hillsides and ruined Cathar castle of Queribus (right).The new estates have been established by an eclectic cosmopolitan mixture of people, as well as natives from other regions of France. They are attracted by a flexibility that is not possible in, say, the Loire Valley or Bordeaux. Here there is a freedom to experiment. If your wine does conform to appellation rules, it can be Côtes du Roussillon, though vin de pays is perfectly acceptable, and even vin de table. The articulate Thomas Lubbe from Domaine Matassa in the village of Calce was simply not interested in Côtes du Roussillon – for him it is synonymous of the wine lake, with a price to match – £3.99 in a British supermarket. He is a shining example of the cosmopolitan mix: brought up in Auckland, worked in Bordeaux and South Africa, now here with his French wife. And he is not alone. Eric Monné of Clot de l’Oum comes originally from Perpignan but spends half the week in the Hague, whilst Mark Hoddy of Domaine de la Pertuisane learnt his wine making at Plumpton College near Lewes in Sussex. And then there are the families who have withdrawn their vines from their village cooperative; young Julien Fournier at Domaine Serralongue, Arnaud Vera at Domaine de la Serre, and Cathy and Daniel Laffitte at Domaine des Soulanes. Eric Laguerre was a cooperative member until he went into partnership with Gérard Gauby to create Le Soula, an estate with some of the highest vineyards in the valley at 600 metres. Alongside this Eric runs his own vineyard, Domaine Le Ciste. (left: Mark Hoddy, Julian Fournier, Eric Laguerre, photos © winetelevision.com).And what about the wines? Ripe Grenache produces some stunning rich flavours, conveying all the warmth of the countryside, giving you a real sense of place, with berry fruits, liquorice, balanced by some subtle oak ageing. Sometimes there is Carignan, which adds the colour and backbone that Grenache can lack, and maybe some Syrah and Mourvèdre, but it is the traditional Grenache that provides the originality. White wines too are from Grenache, blanc and gris, and the often despised Macabeu, but with some subtle oak ageing, so that carefully crafted winemaking can produce quite unexpected and delicious results. There is no doubt that the hills of the Fenouillèdes produces some wonderful original flavours with an individuality all of their own. Sad it is therefore, just as they were beginning to make their name, that officialdom decided to eliminate virtually all the vins de pays of the Pyrenées-Orientales, leaving just the Côte Vermeille on the coast and the Côtes Catalanes for all the wines further inland. As the more vocal growers exclaim, they have nothing to do with Catalonia, nor with the vineyards closer to Perpignan which are the prime producers of Côtes Catalanes. They would like to keep their identity and originality, as indeed they do in the glass. See Fenouilledes stockists on wine-searcher.